Tsakiris chips’ crisp texture, natural potato smell and great taste are what make them special and have kept them at the top for over 50 years. With every one of the Tsakiris flavors one thing is certain: it is by far…the tastiest choice. 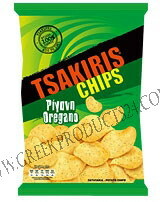 Tsakiris Chips Salted 100 gr.